Former Cardiff captain Jason Perry says owner Vincent Tan is responsible for their struggles in the Championship. The Bluebirds hoped for an immediate Premier League return, but the 4-2 loss to Watford leaves them in 12th and with fans turning against Russell Slade. Perry says it was "as bad a performance as I've seen for a long time" and that Tan "needs to look at himself". "Unfortunately the owner believes he knows football better than anybody else," added Perry. BBC Wales Sport has asked Cardiff City to comment. "Any talks going on within the club are all about what can be done in the January transfer window. There is no question over Russell Slade's future." Perry said: "You've got to create the right culture at your club - a winning culture. The players have got to see that it's organised, that everything is running smoothly. 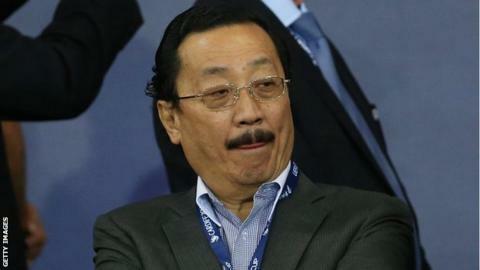 "And it's that structure from manager to Vincent Tan that has let Cardiff City down for a number of years. "It's a reason why they were relegated. It's a reason why fans are voting with their feet and no longer turning up. "He needs to put his hand up and say: 'I need help' and certainly Russell Slade looked a lonely figure in that technical area." Sunday's 4-2 home defeat was the Bluebirds' third loss in five winless games, adding to the pressure on former Leyton Orient boss Slade, who was appointed in October. Perry says the atmosphere at Cardiff City Stadium for the Hornets' visit underlined Cardiff's situation under Tan, saying changes for the better have to come "from the top down". The Malaysian, 62, who recently cleared some of the club's debts, has been at the heart of a continuing controversy over Cardiff's rebrand from their traditional blue to red. "At Cardiff City you have to be better at managing above you than below you," said Perry. "And that is the problem - whoever comes in is going to have the problem of an owner that's constantly interfering and doing things that aren't making the job easier for the manager." Perry believes that Slade "hasn't got a good squad" and that it does not suit the manager's preferred formation. "It lacks balance, lacks variety, it's over-loaded in certain positions, and there's not enough quality in others," he said. "He [Slade] wasn't many people's choice, but he was given the job. He's a 4-4-2 man. "Whoever appointed him should have looked at that - he hasn't got a squad to play the formation he wants to. "He can't do anything more and he's not being helped by what's going on above him." The defeat to Watford was the Bluebirds' ninth league defeat of the season, leaving Perry predicting "tough, tough times ahead for Cardiff". He added: "Just before kick off, walking around there were people not talking to each other, heads down because there's nothing positive to talk about at Cardiff City at the moment. "And that reflected for me in the atmosphere around the stadium during the game and the performance from the players. "Up until the 40th minute when Cardiff were leading 1-0, they actually looked as if they had shape, they were organised, they were closing Watford down. "It's when Cardiff conceded that first goal - when it became 1-1 - that the players' heads also dropped. "They were looking at the floor and I think it highlighted that they've got no leaders in the team and they haven't got the right characters to go and win football matches. "From that moment, Watford dominated possession and their disappointment will be they didn't get six or seven. It was that bad a performance."